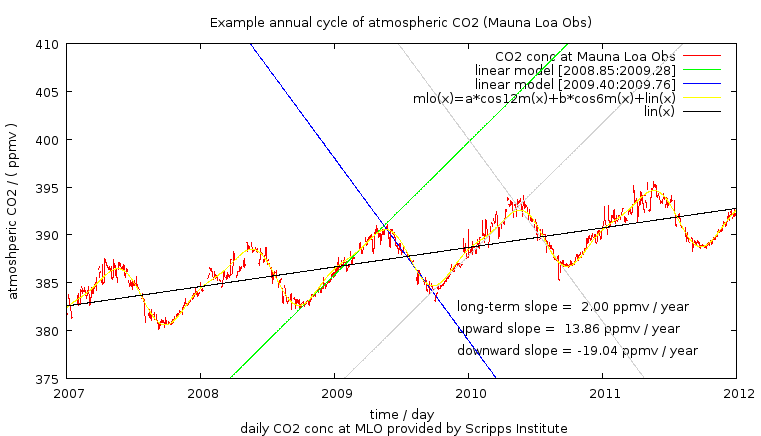 Annual variation in CO2 at MLO appears to be a combination of a 12 month and 6 month cycle plus a long term rise. Over short temporal range the long term can be modelled as linear. The 12mo cycle presumably represents a net effect of opposing NH and SH extra-tropical variation and the 6mo cycle is due to the ‘seasons’ of the tropical zones. giving rise and fall periods of 0.64 and 0.36 , very close to 2:1 ratio.